What is Vmware Virtual Volume? Virtual Volumes (VVols) are VMDK granular storage entities exported by storage arrays. Virtual volumes are exported to the ESXi host through a small set of protocol end-points (PE). Protocol Endpoints are part of the physical storage fabric, and they establish a data path from virtual machines to their respective virtual volumes on demand. Storage systems enables data services on virtual volumes. The results of these data services are newer virtual volumes. Data services, configuration and management of virtual volume systems is exclusively done out-of-band with respect to the data path. Virtual volumes can be grouped into logical entities called storage containers (SC) for management purposes. The existence of storage containers is limited to the out-of-band management channel. Virtual volumes (VVols) and Storage Containers (SC) form the virtual storage fabric. Protocol Endpoints (PE) are part of the physical storage fabric. By using a special set of APIs called vSphere APIs for Storage Awareness (VASA), the storage system becomes aware of the virtual volumes and their associations with the relevant virtual machines. 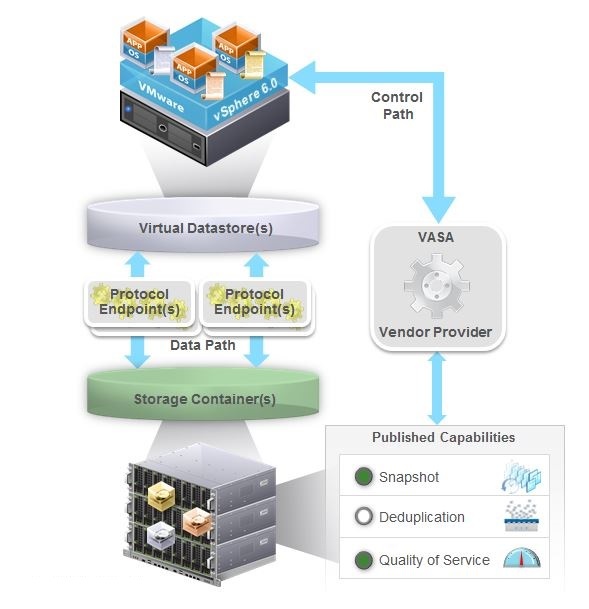 Through VASA, vSphere and the underlying storage system establishes a two-way out-of-band communication to perform data services and offload certain virtual machine operations to the storage system. For example, operations such as snapshots and clones can be offloaded. For in-band communication with Virtual Volumes storage systems, vSphere continues to use standard SCSI and NFS protocols. This results in support with Virtual Volumes for any type of storage that includes iSCSI, Fibre Channel, Fibre Channel over Ethernet (FCoE), and NFS. With Virtual Volumes, storage vendors can use native snapshot facilities to improve performance of vSphere snapshots. Virtual Volumes supports backup software that uses vSphere APIs for Data Protection (VADP). Follow these guidelines when using Virtual Volumes. Because the Virtual Volumes environment requires the vCenter Server, you cannot use Virtual Volumes with a standalone ESXi host. Virtual Volumes does not support Raw Device Mappings (RDMs). A Virtual Volumes storage container cannot span across different physical arrays. Host profiles that contain virtual datastores are vCenter Server specific. After you extract this type of host profile, you can attach it only to hosts and clusters managed by the same vCenter Server as the reference host. Write comment for more any query/comment/feedback.